Each spring, the Congressional Institute sponsors a nationwide high school visual art competition to recognize and encourage artistic talent in the nation and in each congressional district. This event is a wonderful opportunity for students to be recognized for their creative talents, and I encourage anyone that is interested to submit their artwork. Students submit entries to their representative’s office, and panels of local artists in each district select the winning entries, which are then displayed for one year at the United States Capitol. Deadline for entries is April 30, 2012 before 3:00pm CT. Step 1—Read the 2012 guidelines and registration information and Student Information and Release Form. Step 2—Fill out, print, sign and submit the 2012 Student Information/Release Form with each piece of artwork to your representative by April 30, 2012. 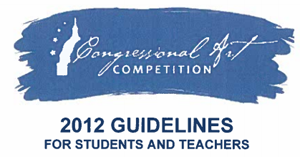 Step 3—Make sure your entry meets all of the 2012 Art Competition Guidelines.